ROCKLEDGE October 2, 2013 — Backwater Paddle Company has been selected for the 2013 Best of Rockledge Award in the Sporting Goods Manufacturer in their local community and business category. These are local companies that enhance the positive image of small business through service to their customers and our community. These exceptional companies help make the Rockledge area a great place to live, work and play. Various sources of information were gathered and analyzed to choose the winners in each category. The 2013 Rockledge Award Program focuses on quality, not quantity. Winners are determined based on the information gathered both internally by the Rockledge Award Program and data provided by third parties. The Rockledge Award Program is an annual awards program honoring the achievements and accomplishments of local businesses throughout the Rockledge area. Recognition is given to those companies that have shown the ability to use their best practices and implemented programs to generate competitive advantages and long-term value. The Rockledge Award Program was established to recognize the best of local businesses in our community. Our organization works exclusively with local business owners, trade groups, professional associations and other business advertising and marketing groups. Our mission is to recognize the small business community’s contributions to the U.S. economy. This entry was posted in Backwater Paddle Products, Marketing My Company and tagged award, Backwater Paddle Company, paddle sports on October 9, 2013 by Paddleman. Backwater Paddle Company was approached by Malibu Kayaks to do a joint marketing campaign this upcoming duck hunting season. Malibu Kayaks wanted to take the lead in promoting kayak duck hunting by outfitting their X-Factor kayak in camo. To spice up the promotion, Malibu Kayaks wanted to include one of our Assault Hand Paddles into the promotional deal. Malibu Kayaks found out about our assault Hand paddles from the Best of Show at the AFTA Awards this year. 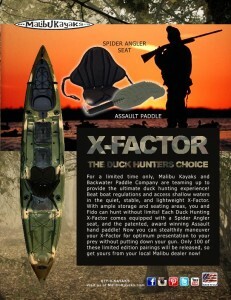 Below is Malibu Kayaks start of their kayak duck hunting marketing campaign, including the Assault Hand Paddle. Malibu Kayaks and Backwater Paddles in joint kayak duck hunting promotion. 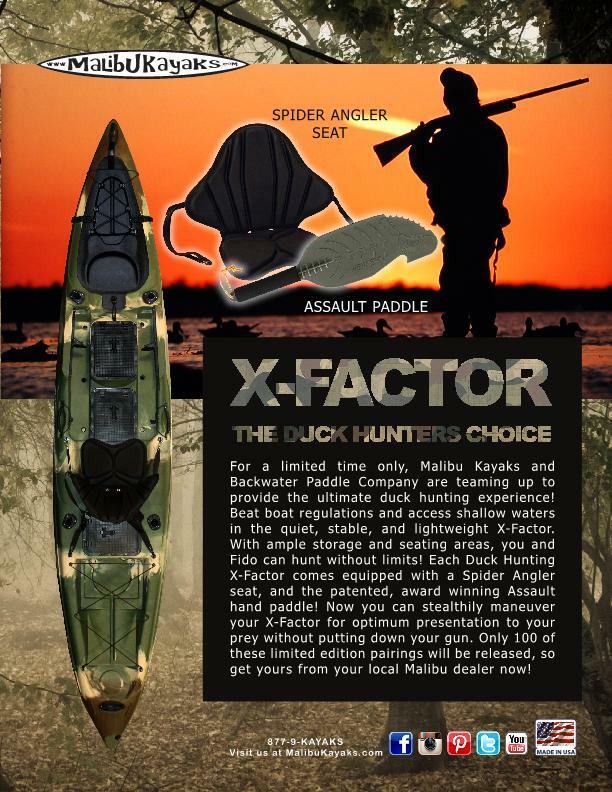 Malibu Kayaks, a world leader in fishing kayaks designed for pro anglers, is teaming up with internationally recognized paddle company, Backwater Paddles, for the launch of their limited edition X-Factor in the new ‘Duck Hunting Camo’. Only 100 of this kayak will be made during the 2013 hunting season, and will come equipped with a Malibu Kayaks Spider Angler Seat and Backwater’s patented Assault Hand Paddle. After thousands of requests from fowl hunting fans to create a wooded camo, Malibu Kayaks surveyed the public to help design the specially selected blend of forest greens, browns, and sands that will easily blend into most US and Canadian flyways. In 2011, 90.1 million US citizens participated in the National Survey of Fishing, Hunting, and Wildlife-Associated Recreation. Of that number, 9.4 million both fished and hunted, and 2.6 million are registered migratory fowl hunters. With numbers like that, the need for a reliable and easy mode of transport into difficult regions of popular flyways was hard to deny. Compounding consumers needs are the ever increasing regulations and fines imposed on motor boats in local waterways, regulations that don’t apply to a paddled kayak. A low-lying, sit-on-top kayak acts as a much more advantageous partner to the duck hunter, by providing more cover, less noise, and easier access – not only in the surrounding territory but at the paddlers hands. With a 360 degree view and ability to jump on and off quickly, that includes Fido who fits easily on the gator hatch or back well, the user is able to spend less time adjusting and more time enjoying his sport. The X-Factor, originally designed for fly fishing, is 14’.4” long, 33” wide, and weighs in at 62lbs, allowing consumers to enjoy a ride that is stable, quick, easily transportable and has ample storage. Always ensure to get adequate Camping Supplies as to not run into any form of shortage. This entry was posted in Uncategorized on October 1, 2013 by Paddleman.